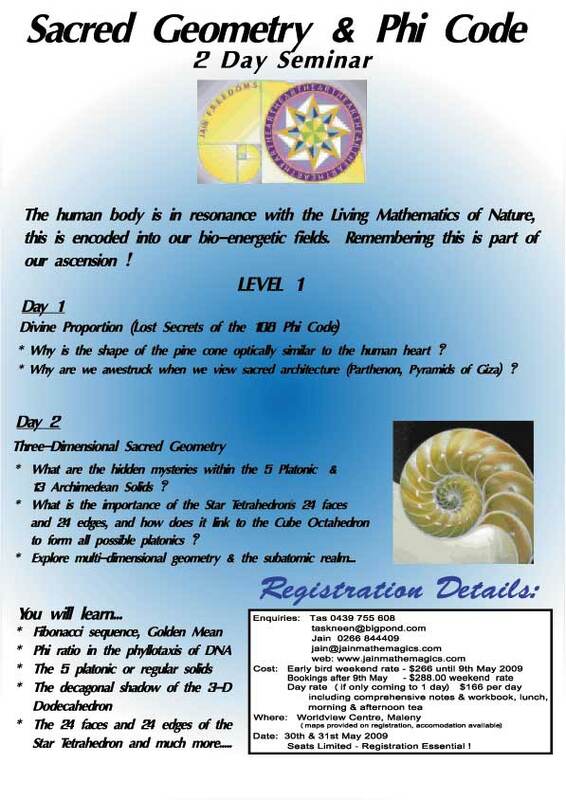 This is your chance to learn all the valuable mathematical and geometrical knowledge of the Ancient Civilizations. who are interested in expanding their Knowledge. being organized by Tas Kneen in the SUNSHINE COAST. how they relate to crystals and atomic sturctures. at the World View Centre, Maleny. and requires another day on both these same topic as well. Level 4 is the Teacher Trainer segment. The complete seminar lasts 12 days divided into 4 weekends. over the last 30 years thanks to his teachings all over the world. to the people who want to expand their knowledge. an ancient yet simple system of mental online arithmetic. which can solve all known mathematical problems. in your head…with no calculator, pen or paper. atomic structures often symbolic of life’s journey. is the centre of the Sino/Tibetan Cosmology. and Equality in all dimensions. and why we are attracted to the famous Monna Lisa. the most famous Eastern prayer for Enlightenment. the Living Mathematics of Nature. Embrace part of the Ascension process already morphologically and geometrically encoded into our bio-magnetic and bio-electrical fields. Fourth Dimension and Time Travel. and the 13 Archimedean Solids. that Pythagoras called the fifth element – Spirit aka Dodecahedron.